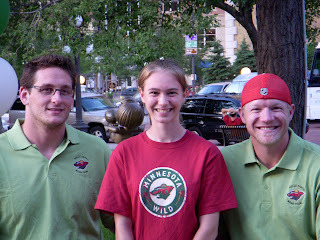 Derek Boogaard and Mark Parrish with some random chick. I took this at the Summer Bash. We in Minnesota, have always know that Mark Parrish is awesome. Others found out since he started playing in the NHL. Now, he is adding to his awesomeness by supporting a charity in Minnesota to help disabled and diseased children. I meant to get the word out about this earlier, but I got swamped with leaving for Oregon. The actual event for this year is over, but it sounds like there will be more events and money raising to come. It's a good cause. The Minnesota Wild has a presence at the Minnesota State Fair again this year. Details can be found at the official website, or at the link below. The fair ends on Labour Day, so be sure to make plans soon! While you are there, we boast many fine foods on a stick. I recommend trying them. Also, go to the corn on the cob stand. Get an ear, and eat it while standing in line for another . Repeat as necessary. The Wild have jumped on the bandwagon and are getting new sweaters also. No clue what they will look like, I only know that they will be red. I really don't think they should ditch the green, but apparently they seem to think that Minnesotans prefer the red sweaters. Whatever. It gave me the excuse I needed to beg for (and recieve) a green Parrish sweater. So the Twins apparently don't want to make the playoffs this season, or at least that's what they are telling me. They are 9 games back from Cleveland, and 5.5 games back from Detroit. Furthermore they are 7.5 games back in the AL Wildcard race behind Detroit, Seattle, and NY (Yankees). I haven't given up on them yet, but I'm really not pleased by what I see. I strongly suspect I'm not the only one in fits about their inability to step it up when both Detroit and Cleveland slumped. We cannot rely only on 2-3 people to always step up. Justin Morneau and Joe Mauer both slumped at the same time, and at a fairly bad time down the stretch. I can't really harrass them too much, since both are young players and will hopefully get things figured out. Torii Hunter should have spent less time yapping and more time in batting practice or talking with hitting coach Joe Vavra, because he has been pretty average this season missing important catches and striking out. TR should have traded him while he had the chance. My parents got their season tickets today and they got to see what the new sweaters look like. This blogger has a picture of the coupon up. I think a few of his Islanders teammates were going to help out with the charity softball game and stuff. I also saw that the auction contained several Islanders things. I keep trying to insist that I hate Boogaard and that he needs to stay the heck away from my Hemsky, but then I see him in off-ice pictures wearing those dorky glasses and I just giggle and sigh and hate him a little less. I understand. Boogaard is really nice off the ice. 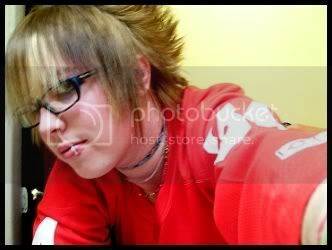 He seems to make lots of women giggle and sigh recently, especially ever since he started working on his fro. The admiration seems to be reciprocated since he listed one of the reasons that he likes playing in Minnesota as "there are a lot of pretty women here". That wasn't the only reason he listed, but it made me laugh. At least you have had time to come to terms with this. The Twins have been flirting with being a playoff team all season...they just can't seem to make up their damn minds. Bonser has really sucked this year and can't seem to pitch more than three innings without completely melting down and giving up 10 runs. Twins fans cringe when he's pitching and decide to skip that game in favor of more enjoyable activities like cleaning gutters, washrooms, or smashing their faces with sledgehammers. I feel your pain.